The Transhaven TP320 32 cubic yard portable compactor is a unique design, offering maximum benefits to the following industries: construction, supermarkets, restaurants, hospitals and hotels. The TP320 enables the benefits of waste compaction to be achieved in the minimum of space, with the optional benefit of liquid retention, whilst not being confined to a specific site or position with the ability to be moved. An open or closed hopper is available and the added option of a cart tipper system. A concrete base is not required and there are no ongoing container rentals with a portable compactor thereby reducing costs. There are environmental improvements as there is no refuse spillage, vermin are kept out, insects are discouraged and bad smells are minimised. Compaction also reduces the risk of fire, enclosed compacted waste is less likely to catch fire or burn easily. Compactors are cost effective and usually 2 years after installation the initial investment is returned. 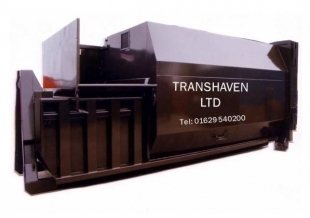 As well as supplying your compactor Transhaven also offer a full waste management scheme. Transhaven offer capital payment, lease payment and rental. We also manufacture theTP140 which is a 14 cubic yard Portable Waste Compactor, suitable for smaller waste applications or where space is at a premium on site.